It is easy to work with Bank account where you can set up bank account in manner that the transactions are automatically imported to Xero. You just need to reconcile your sales and purchases invoices with the bank account and it is done. While adding bank account you shall be prompted to ask whether it is bank account or a credit card account. You Just need to enter the name of Bank, your account number . Xero would prompt you in case bank feeds are available for the said bank account. Xero would give you different options for selecting a bank account. Account name is the name which you would like to appear in Xero. Currency is the default currency in which your bank account is managed. Now you can work on your bank account and reconcile the transactions. This is how your bank account would look like with imported feeds. You can view your bank balances in Dashboard. 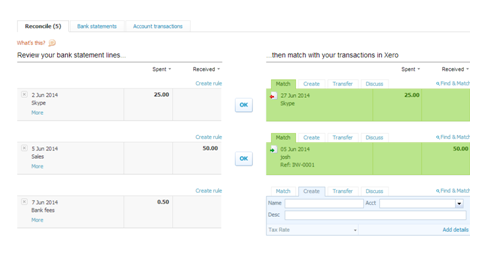 Manual import:- You can manually import the transactions in Xero by a CSV template provided by Xero. We have not dealt with Manual import feature in this file. You can import a bank . However you can follow following steps for importing a bank statement. Log in to your online banking website and save a bank statement in either .QIF format (Quicken) or .OFX format (MS Money) to your computer. From Xero’s Dashboard select Manage Account > Import a Statement from your own bank account that you added in the step above. Locate and select the file downloaded from your bank and click Import. Automatic Bank Feeds:– You can use Automatic bank feeds feature in Xero where Xero would automatically import the transactions on a daily basis. In this manual we have explained with Automatic Bank Feeds in details. You can match the bank feeds in Xero with suggestions by Xero. Xero automatically suggests the reconciliations based on the available data with it. You just need to press OK and the bank transaction is reconciled. You can see the unreconciled bank statement lines going to Bank reconciliation. 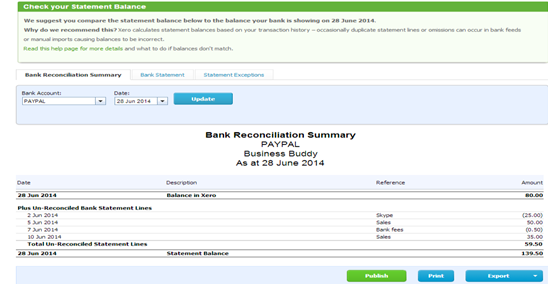 Bank Reconciliation shows the transactions which are yet to be matched in Xero. Once a complete reconciliation is done, Xero bank balance would match with the statement balance and there would be no unreconciled bank statement line. Cash Withdrawal from Bank: For Cash drawings from bank you need to create a Bank in Xero called “Cash Account”. Xero does not have “cash in hand” Ledger automatically created in it. 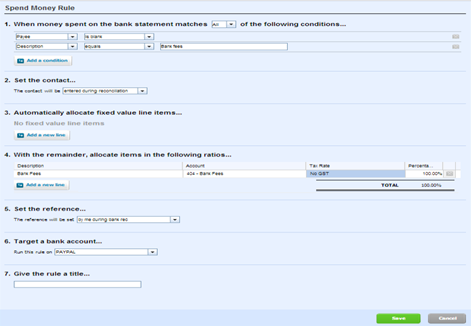 Bank Rules can be created for automatically allocating the transactions based on predefined rules. 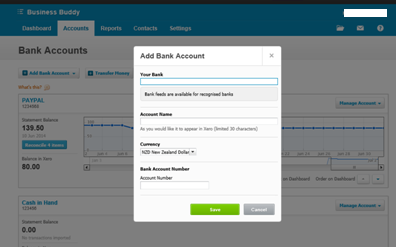 You can create bank rule by Going to “Create rule” button in Xero bank reconciliation. Here is how create rule would look like in Xero. Name of Payee and description. Account where the details are to be matched. Here is how to create rule in Xero.